SALEM—McNary senior Hakam Nagra could not remain silent as the Celtics went into halftime trailing at McKay. The speech was just what McNary needed as it came from behind to defeat the Scots 21-7 on Friday, Sept. 22. Jose Solorio was one of the player’s that took Nagra’s words to heart. Down 7-0 to open the second half, Solorio and quarterback Erik Barker connected for a 41-yard touchdown on third-and-long to tie the game with 10:24 remaining in the third quarter. Junior Walling started the scoring drive with runs of 23 and 34 yards. “We had to do exactly what Sprague did to us, be mean, mad, show McKay that we’re not soft and we can compete with the teams all around,” Walling said. McKay answered with a long drive but on the 10th play ended with a fumble that McNary junior Jacob Jackson recovered at the Celtic 4-yard line. McNary then drove back into McKay territory but Kyle McCallister dropped a pass on fourth down. The Scots looked to strike quickly on a reverse pass but a wide open streaking receiver dropped the ball. Jackson then intercepted a McKay pass to give the ball back to the Celtics, who went 65 yards on 10 plays to take a 14-7 lead with 10:11 remaining in the fourth quarter. Walling capped off the drive with a 1-yard touchdown run. Barker added a 1-yard touchdown run with 37 seconds left to play to seal the victory. 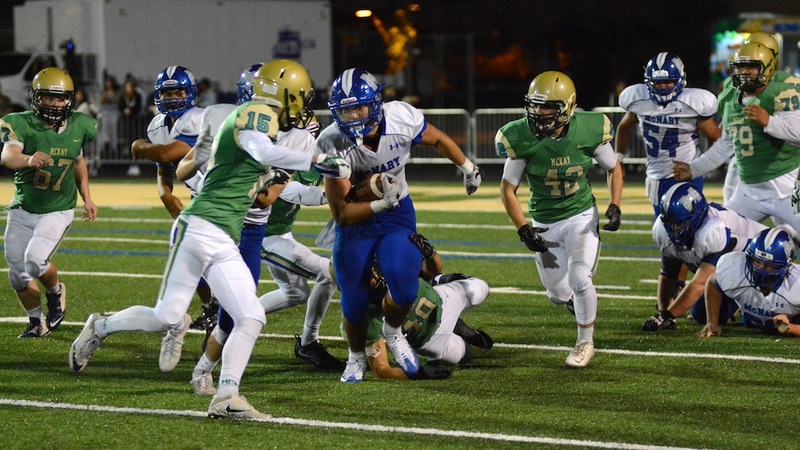 Struggling in the passing game, McNary had to do most of its damage on the ground without its leading rusher as senior Lucas Garvey left in the first quarter with a shoulder injury and didn’t return. Walling took the load of the work, finishing with 171 yards on 29 carries. Senior Freddy Jimna added 31 yards on eight attempts. Robert Benson, who had mostly played junior varsity this season, picked up 37 yards on nine carries as the Celtics finished with 281 yards on the ground. Devyn Schurr, a junior varsity cornerback, took Garvey’s place on defense. Penalties, eight for 70 yards, killed the Celtics in the first half. McKay scored its only touchdown on a short field. Starting from the McNary 35-yard line, the Scots were aided by two defensive offsides penalties. On offense, the Celtics were constantly facing second and third-and-longs. Barker threw two interceptions in the first half, including one in the end zone, trying to get the ball to McCallister. Solorio had two interceptions, one in each half, as McNary was plus-3 in turnover margin.